Until recently, you really had almost no choice when it came to the color of your Jeep's soft top. It's black. Or some version of tan or gray. Maybe blue if you had an older CJ. That's it. When the JK was first introduced, you could only get a black hard top too. Those were dark times for anyone who likes variety. Do you remember the feeling you got when you first saw a body color hard top on a Wrangler? It was pretty cool, wasn't it? It totally changed the vehicle's appearance. That's how the new Premium Color Soft Tops from Bestop should make you feel. It's the same idea. Why does a soft top have to be black? The guys at Bestop always push the limits of soft tops. 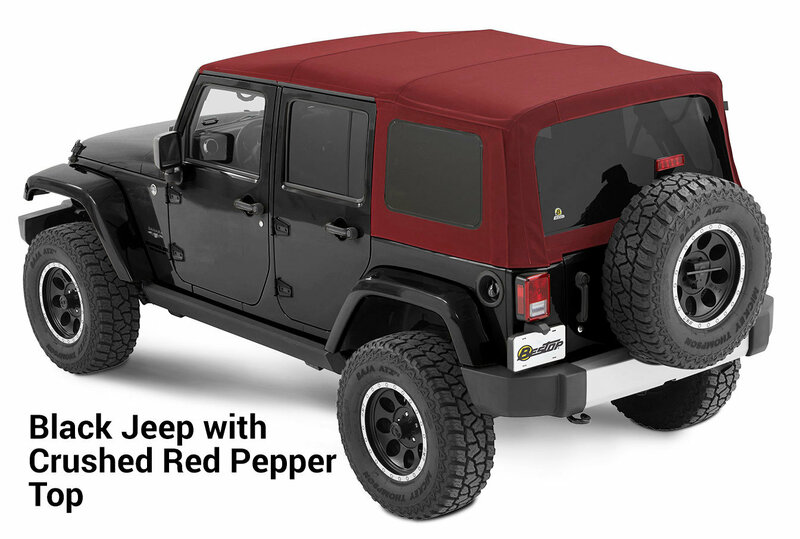 They did it with the Trektop NX Glide and they did it again with the Premium Color Soft Tops. It's important to note Bestop did not design their new Premium Color Soft Tops to match the body color of your Jeep. It's completely by chance that Pebble Beige is almost identical to Mojave Sand. Instead, they designed a collection that would complement your Jeep's body color. Thanks to this, you now have the choice of putting a tan top on a black Jeep, or a red top on a white Jeep. The possibilities are only limited by your imagination. These Premium Color Tops have truly started a new era and there is no reason you should limit yourself to just a standard black top any longer. That is, unless you really like that black top look on your Jeep. Let's take a brief historical look at the use of color on modern Jeep tops. In the days of the TJ Wrangler, and recently on JK's, there were just two basic choices, black or tan. Black came standard for all body colors, while tan was reserved for specific colors it complemented. There were a few other colors sprinkled here and there, but the choices were relatively few. When the JK was born, black - again - was the standard majority top color, with a limited few others offered in Khaki. However, after 2012, you could no longer choose anything but black. 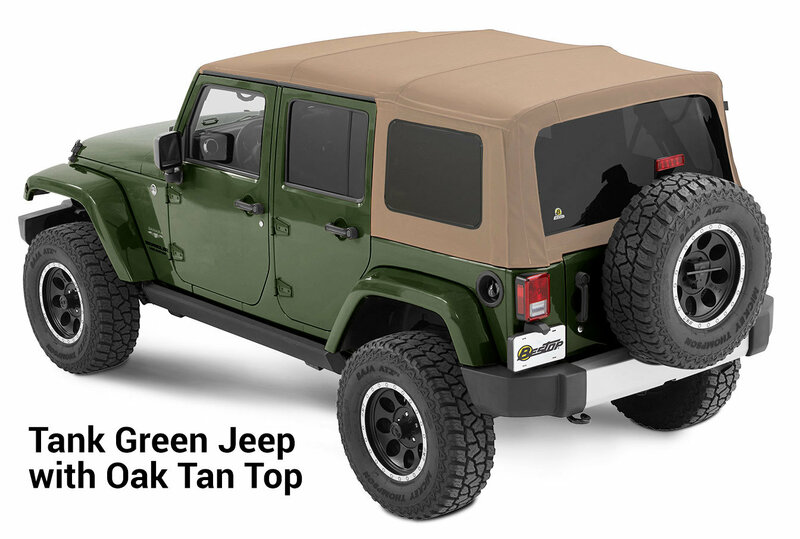 Jeep didn't reintroduce tan soft tops until 2018, but their designers chose to use color on the Wrangler in other ways. Take a look at the tow hooks on the top-tier Rubicons, they're red. Look at the accents on the 75th anniversary edition, they're bronze. The roof of the Chief edition is bright white. Jeep knows that color alone can have a huge impact on appearance. Knowing this, I decided the time has now come for me to ditch my Jeep hard top and install a soft top instead. So let me walk you through my color choice process, and how I decided on the new top color for my Jeep. The new color choices from Bestop are Black Twill, Crushed Red Pepper, Navy Blue, Granite Gray, Oak Tan and Pebble Beige. Every one of these colors looks great and vibrant. The fabric is soft twill which gives them some real depth. 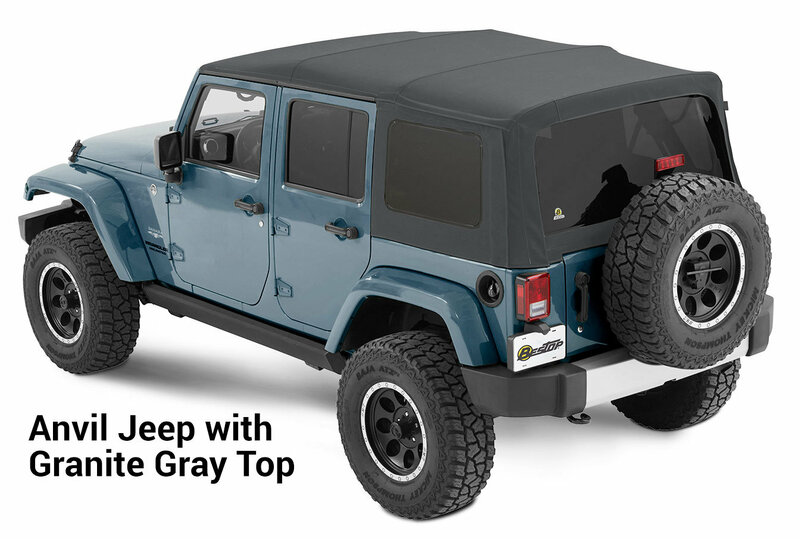 Right away I knew Navy Blue and Granite Gray are out as these colors just do not match any part of my Jeep's color scheme. Black is out for me too because, well, I really want to be different. So that leaves me with Crushed Red Pepper, Oak Tan and Pebble Beige. Now, Crushed Red Pepper is an interesting option because it compliments my Jeep's Mojave Sand paint nicely, and with a rattle can of paint my d-rings and winch hook could match. I pictured this in my mind's eye and it looks pretty good, but ultimately I decided to take red off the list because it strays too far from my original theme for Savanna (what I've named my Jeep). Only Oak Tan and Pebble Beige remain. Both are shades of tan that go nicely with Mojave Sand, but Oak Tan is darker and richer, and would give Savanna a nice layered monochromatic look. This is also a look that is 'in' right now and you see it everywhere in automotive. Dark gray stickers on a black Jeep. Bright red highlights on a dark red Jeep. But I'm crossing Oak Tan off my list because I think layered monochromatic is too 'modern' for Savanna's old school look. That leaves Pebble Beige and this color is very similar to the Mojave Sand paint on my Jeep. So much so that it appears almost identical, making for a very monochromatic look. I really think this color will work well with my theme, and will look great overall. That's my thought process for picking the color for my top. Now it's your turn. What direction will you go? A white Jeep with an Oak Tan top would look awesome. Throw in some Smoke Bronze wheels and bumpers and you've got a wicked combo. I'd also love to see a Anvil Jeep with a Granite Gray top. Somebody should try a black Jeep with a Crushed Red Pepper top, and paint the winch and tow hooks to match. If you're not afraid of color change and decide to go away from a black top, definitely post your pictures in the comments. I'd love to see them. Check out the photo gallery for some color combos I put together.